Diwali or Deepavali, also known as the "Festival of Lights," is the biggest festival in the Hindu calendar, celebrated in early fall of each year. But when Diwali occurs in the calendar changes every year. Spiritually, Diwali symbolizes the victory of light over darkness, good over evil, and knowledge over ignorance. As the term "Festival of Lights" suggests, the celebration involves millions of lights illuminated from rooftops, doorways, and windows in thousands of temples and buildings all over the countries where the festival is observed. Fun Fact: The date changes each year because the festival is scheduled according to the lunar calendar: Diwali celebrates the new moon of the first lunar month, Kartik. Fun Fact: As the festival of lights, Diwali is characterized by massive amounts of fireworks and firecrackers, intended to offset the cold, dark nights of the coming winter. The date to celebrate Diwali generally changes by a week to 10 days every year. The reason Diwali's celebration date is different each year is that each of the Hindu calendars—there are several—is lunisolar, meaning they take into effect both the movements of the sun and the moon. A solar calendar (like the Gregorian one) has an average of 365.24 days. A lunar year varies in length, each month containing approximately 29.5 days (354 days) depending on the moon's movement with respect to the earth. In some months, a day needs to be dropped to correlate with a shorter lunar cycle. 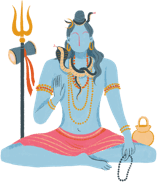 The Hindu lunar calendar has two parts: dark (Krishna paksha, or "waning moon" in Sanskrit) and light (Śhukla paksha, or "waxing moon"), and the new moon (amavasya) always occurs in between the parts, typically on the 15th. Diwali falls on the 15th day of the Hindu month of Kartik, which is the new moon day of the first month of the lunar year. The word "Deepavali" means "a row of lights" in Sanskrit, and its origins were likely as an ancient harvest festival. Today it is the "festival of lights," attached to various mythological stories, particularly tales about Lakshmi, the goddess of wealth. The date of Deepavali on the new moon makes it the darkest night in the month of Kartik, when the nights are cold, long, and dark: all the lights make that darkness easier to bear. Diwali is typically a four- or five-day event, starting two days before the new moon and extending two days afterward. It is traditionally a puja, or a celebration that worships, honors, and shows devotion to the divine. In India, while everyone celebrates Deepavali, people don't amass in public, but rather in small groups with their friends and families in homes, neighborhoods, and local temple communities. In the diaspora, all the countries in the world outside of the Indian subcontinent where Indian people have settled, Diwali is considered a public celebration open to Hindus and anyone else. Large government-sponsored festivals are held in London, Sydney, Toronto, and Edinburgh, and they are often a showcase for Indian culture, music, dance, fashion, food, crafts, and fireworks. The incredible amount of fireworks and firecrackers set off during the five days of Diwali have become an issue in many Indian cities, to the point that ambient air and noise during Diwali are considered somewhat of a health hazard. 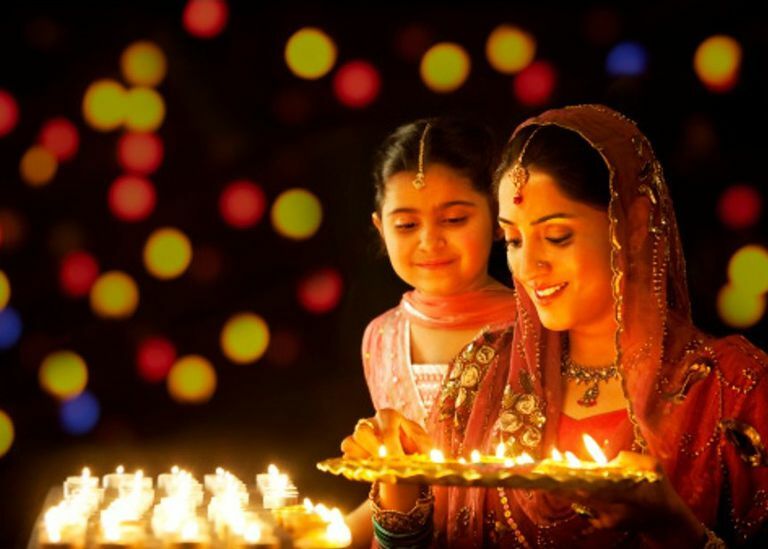 The Diwali festival dates back to ancient times in India. It is mentioned in Sanskrit texts dating from the fourth century CE but was likely practiced for many hundreds of years before that. Although most important for Hindus, the festival is also observed by Jains, Sikhs, and some Buddhists. While different historical events are observed in different regions and by different faiths, Diwali represents the triumph of light over darkness, and knowledge over ignorance for all the cultures that celebrate it. Beig, G., et al. "Evaluating Population Exposure to Environmental Pollutants During Deepavali Fireworks Displays Using Air Quality Measurements of the Safar Network." Chemosphere 92.1 (2013): 116–24. Print. Booth, Alison. "Whose Diwali Is It? Diaspora, Identity, and Festivalization." Tourism, Culture & Communication 15.3 (2015): 215–26. Print. Chirkut, Sheila. "The Festival of 'Deepavali' as Marks of Tradition and Identity for Working, Married Hindu Women: Continuity and Change." Journal for the Study of Religion 20.1 (2007): 87–109. Print. Rao, Vijayendra. "Celebrations as Social Investments: Festival Expenditures, Unit Price Variation, and Social Status in Rural India " Journal of Development Studies 38.1 (2001): 71–97. Print. What Are the Reasons Hindus Celebrate Diwali? How Does the Hindu Calendar Correspond to the Gregorian? Who Was the Hindu Goddess Saraswati?